Task Coach is a simple todo manager to manage personal tasks and todo lists. It grew out of Frank's frustration that well-known task managers, such as those provided with Outlook or Lotus Notes, do not provide facilities for composite tasks. Often, tasks and other things todo consist of several activities. Task Coach is designed to deal with composite tasks. Task Coach is developed by Frank Niessink and Jerome Laheurte, with help of different people providing translations. Many people use it on a daily basis, but there are still a lot of features missing. Free Game Speedup Tool. Close startups, free up memory and tuneup network to keep your PC in top Game Performance. 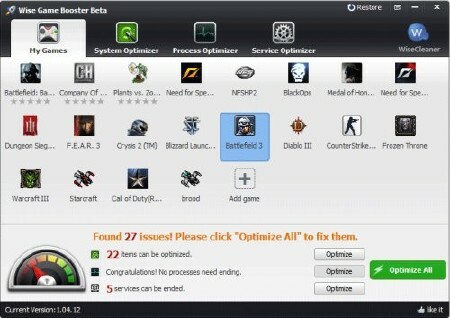 Wise Game Booster is designed to enhance your gaming experience. It can boost your PC performance immediately by optimizing system settings, ending unnecessary programs and stopping irrelevant services with one single click, making your system resources focus only on the game you are playing. Wise Game Booster allows you to add your games into "My games", so you don't need to find the games from crowded desktop icons. Here you can manage your games and check the game information.